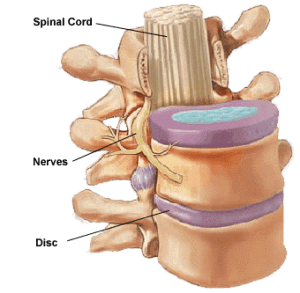 An intervertebral disc is a ring of biological matter separating one bone of the spine (i.e. a vertebra) from another. It is made up of two layers; a soft, pulpy inner layer closer to the spinal cord, surrounded by a tougher, fibrous outer ring. This layer is made of a strong, resilient material to carry out its functions. An intervertebral disc gives support to the bones above and below it, contributes to shock absorption in the spine, and helps to ensure that the proper shape and structure of the back is maintained. It is possible, however, for the outer ring of these discs to wear out or break. 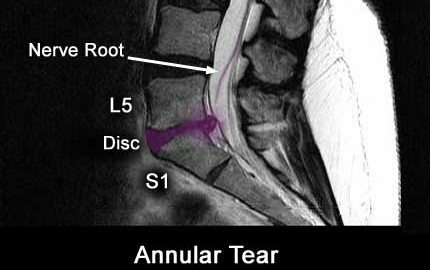 When this occurs, the inner, pulpy layer pushes outward and protrudes into the spaces between the normal location of the disc and the bone around it. This is known as a bulging disc. Learn About Painful Bulging Discs – Watch Now! People can develop bulging discs without symptoms; however, when the inner ring protrudes closely enough to a spinal nerve—a network of which run roughly parallel to the spine—this can result in significant amounts of pain. The pain is also often constant (chronic) because the source of the pain does not differ, as the bulging disc presses against, or in close proximity to, the nerve all the time. Bulging disc syndrome is most often associated with the cervical (neck) vertebrae, or those in the lumbar (lower back) region, causing pain in these areas. Bulging discs can occur for no apparent reason at all. More common causes that are known are wear and tear, usually associated with age. It is also understood that bulging disc syndrome can be the result of improper bending, or repeated incorrect spinal movements, such as simply sitting improperly in a chair. Normal spinal movements cause almost no pressure to the spine, partially because of the presence of discs. However, sharp, stressful, or unusually laborious movements, such as bending with the back to lift something, heavy lifting, or even sitting down result in significant increases in pressure in the relevant regions in the spine. This can result in the tearing of the outer ring of a disc. The inner disc then bulges or protrudes outward into the vertebral spaces, where it may physically compress or irritate a spinal nerve, and thus cause pain. This pain is a result of the inner disc’s proximity to the nerve, as well as inflammation of the nerve caused by molecules released by the inner ring’s tissue when it bulges outward. Bulging disc syndrome tends to occur in vertebrae of either the neck or lower back. When discs in the neck bulge, it can result in chronic neck, head, or facial pain. It can also sometimes result in constant pain in the shoulders, arms, or fingers. When discs in the lower back bulge, it can cause chronic lower back pain, pain in the pelvis, buttocks, and even in the feet or toes. It can also be a source of sciatica, wherein specific nerves controlling the thighs are compressed, causing pain or numbness in this region. Bulging disc syndrome is detected by imaging techniques such as magnetic resonance imaging (MRI) or fluoroscopy of the disc (discography). There are a number of treatments for bulging disc syndrome. Epidural injections are injections of anesthetic medications into the spaces of the spine where nerves are located. They can be an effective treatment for pain caused by disc protrusion. These are injected into the vertebrae affected by bulging disc, i.e. cervical, lumbar, or sacral. These injections can also include steroids to relieve the inflammation that can be caused by bulging discs. If epidural injections do not effectively treat the pain, more direct measures may be advised. These include disc denervation, a technique in which pain signals are reduced by selectively disrupting the affected nerve. This is done by numbing the area around the disc, and then inserting a probe into the region of the nerve, which then delivers radiofrequency waves that will reduce the signalling from the nerve. Another procedure targeting the disc itself is discectomy, a surgical procedure in which the damaged and protruding disc tissue is removed. An example of this is use of the Styker Dekompressor®, which is inserted through the skin (after anesthetics) to remove the damaged material without harming the nerves affected. Discectomy, or percutaneous disc decompression, has been shown to provide significant pain relief for up to two years after the procedure. The risks of the procedure are mainly bleeding, infection, and nerve damage after the procedure. Anesthetic injections can cause side-effects such as chest discomfort, nausea, and nerve damage. Steroids, if used, can cause reduction of the immune response, weight gain, and arthritis in some cases. Bulging disc syndrome is a condition in which the outer ring of a vertebral disc breaks or wears down. This results in a protrusion of the inner ring that can cause chronic pain if it occurs near a spinal nerve. 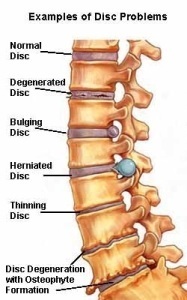 Bulging discs can cause neck, head, shoulder, arm, or finger pain if located in cervical vertebrae. If in the lower back, they can cause pain in that region, or in the pelvic region, thighs, buttocks, feet, or toes. 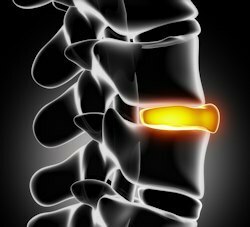 Bulging discs may be treated with injections into the spine, delivering anesthetics to relieve the pain, and sometimes steroids to treat the inflammation caused by bulging inner disc tissue. If these are ineffective, more invasive procedures, such as disc decompression may be considered. These have a moderate incidence of side effects such as bleeding or infection, but are effective and more long-lasting in terms of pain relief. Igarashi T, Kikuchi S, Shubayev V, Myers RR. 2000 Volvo Award winner in basic science studies: Exogenous tumor necrosis factor-alpha mimics nucleus pulposus-induced neuropathology. Molecular, histologic, and behavioral comparisons in rats. Spine. 2000;25(23):2975-2980. Maus T. Imaging the back pain patient. Physical medicine and rehabilitation clinics of North America. 2010;21(4):725-766. Pinto RZ, Maher CG, Ferreira ML, et al. Epidural corticosteroid injections in the management of sciatica: a systematic review and meta-analysis. Annals of internal medicine. 2012;157(12):865-877. Buy X, Gangi A. Percutaneous treatment of intervertebral disc herniation. Seminars in interventional radiology. 2010;27(2):148-159. Birnbaum K. Percutaneous cervical disc decompression. Surgical and radiologic anatomy : SRA. 2009;31(5):379-387. Singh V, Benyamin RM, Datta S, Falco FJ, Helm S, 2nd, Manchikanti L. Systematic review of percutaneous lumbar mechanical disc decompression utilizing Dekompressor. Pain physician. 2009;12(3):589-599. Manchikanti L, Singh V, Falco FJ, et al. An updated review of automated percutaneous mechanical lumbar discectomy for the contained herniated lumbar disc. Pain physician. 2013;16(2 Suppl):Se151-184. Manchikanti L, Singh V, Calodney AK, et al. Percutaneous lumbar mechanical disc decompression utilizing Dekompressor(R): an update of current evidence. Pain physician. 2013;16(2 Suppl):Se1-24.